Today, every internet consumer is faced with the challenge of protecting their PCs from online threats in the form of viruses, malware, and other vicious programs. There are several anti-virus software systems that promise to keep PCs safe and secure and almost all of us have one such software installed on our PCs. I have tried several anti virus programs but have found most of them inadequate. They either fail to identify immediate threats, or are too heavy, thus slowing down my PC performance. And some of them even have a cluttered interface stuffed with so many options, I’m lost! Recently my PC was hit by a malware and my so-called secure antivirus program failed to identify and eliminate the threat, with the result that I lost months of hard work, and days of productivity in trying to eliminate the problem. I was on the lookout for an effective alternative antivirus program and chanced upon Vipre antivirus software. 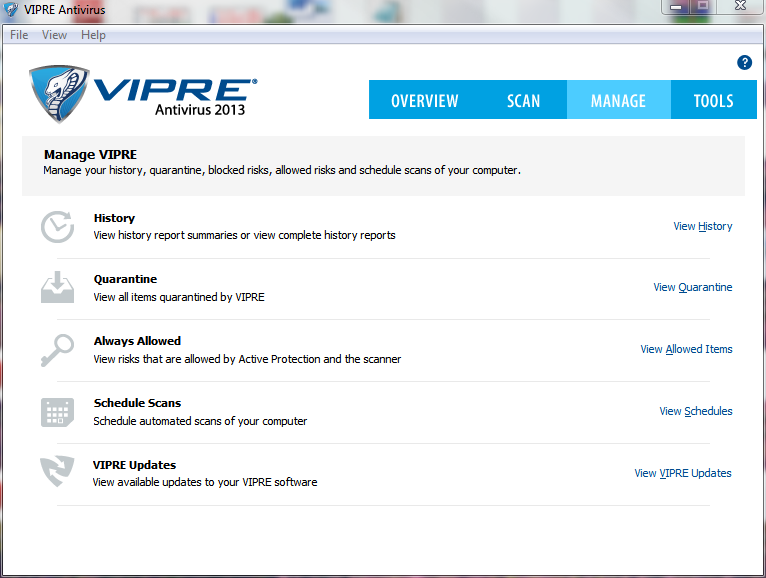 I heard a lot of good things about VIPRE 2013 and decided to install it on my PC and share my review with you. Plus there was the added bonus of sharing the review as part of the SocialSpark community. So here goes. What Makes for a Good Antivirus Software? There are plenty of anti virus programs in the market today that claim to be the best; BitDefender, Kaspersky, Avast, and Norton just to name a few. When deciding on one that will work best for you, you need to take into account several factors. Does the software detect all types of viruses, even the latest ones? Does it eat into much of the PC’s resources and slow down the PC when scanning? Does it offer comprehensive scanning features such as scanning compressed files, emails, and downloads, spyware scanning, malware scanning, creating scan logs, enabling option to recover infected files and so on? Does it offer an easy-to-use interface with easy configuration options? Does the software offer quick and fast scanning? One of the first things you’ll notice about VIPRE 2013 is that it quickly identifies and eliminates conflicting programs before installation. This ensures that the installation process is speedy and quick without any complications. Plus there’s the advantage of avoiding those long winding wizards and UAC controls that are usually part of the installation process. There’s a quick link that gives you the option to choose where you wish to install VIPRE 2013 ( if you want to change the installation location). The only other work that you need to do during installation is enter the product key. You can also choose to be a part of the Threatnet community to help fight malware by sending anonymous data about potential threats detected on your PC to GFI Software experts. That’s it for installation and setup. A pretty effortless process! 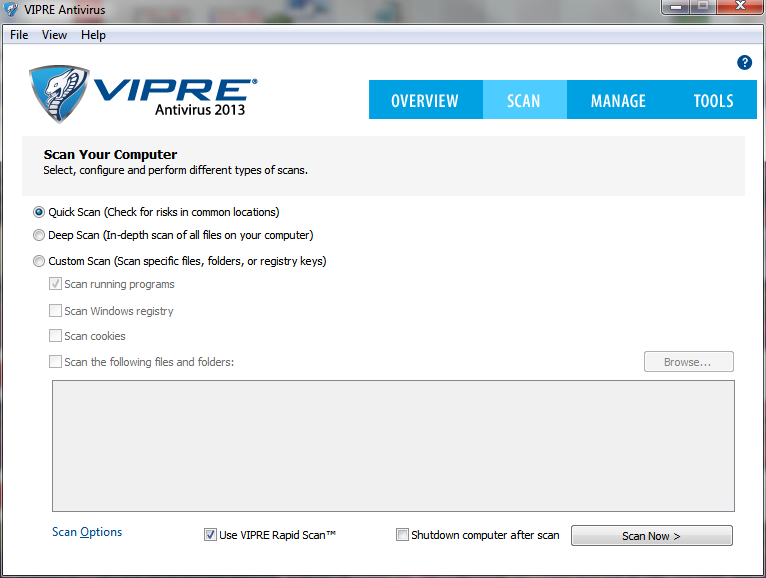 VIPRE then does an immediate scan of your PC for any pre-existing malware or threats. One of the first things you notice about VIPRE is its simple, clean and intuitive interface. 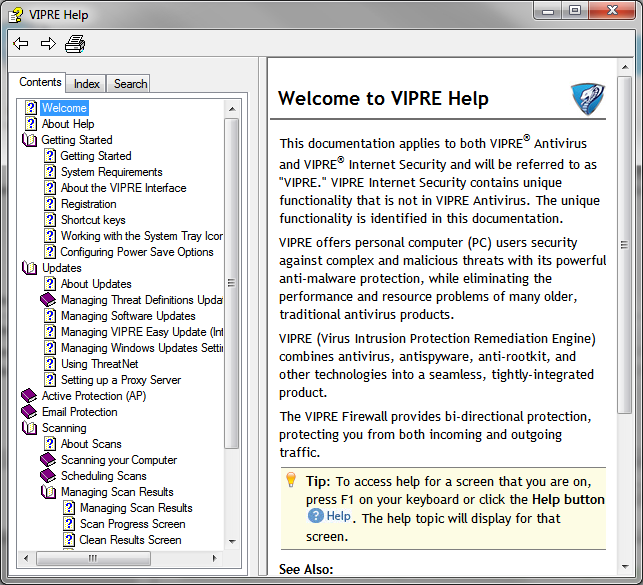 Unlike other anti-virus programs, VIPRE’s system features and configuration options are easy to find and use. There are 4 main tabs on the Home screen; each one clearly listing the common things you’d do with an anti-virus program. Clearly indicates the status of your scan, when it was last done, and when the next one is scheduled. You can also see the protection status, which indicates if your protection is active and enabled, and you can also check to see if your anti-virus definitions are up-to-date! This is the area which holds the most important tasks of the program – the scanning options. You can do a quick scan, a deep scan, or a custom scan. Plus, you can configure what each of these options do using the Scan Options link. This section lists the history of your scanned results, items that were quarantined by VIPRE, items that are allowed, list of scheduled scans, and updates that are available to the software. All pretty simple and self explanatory. The cool factor about this is that even a lay person can effortlessly manage the various tasks and activities related to PC protection. This area lets you view settings for your computer that are normally hidden and lets you perform certain advanced functions such as configuring the file_eraser, and maintaining your browsing privacy. The VIPRE 2013 program has built-in support on practically every aspect of the program. If you need live tech support, the team is on hand with a Live Support Chat center or a one-on-one phone support option. Alternatively, you can browse through their support forum, or submit an ticket. 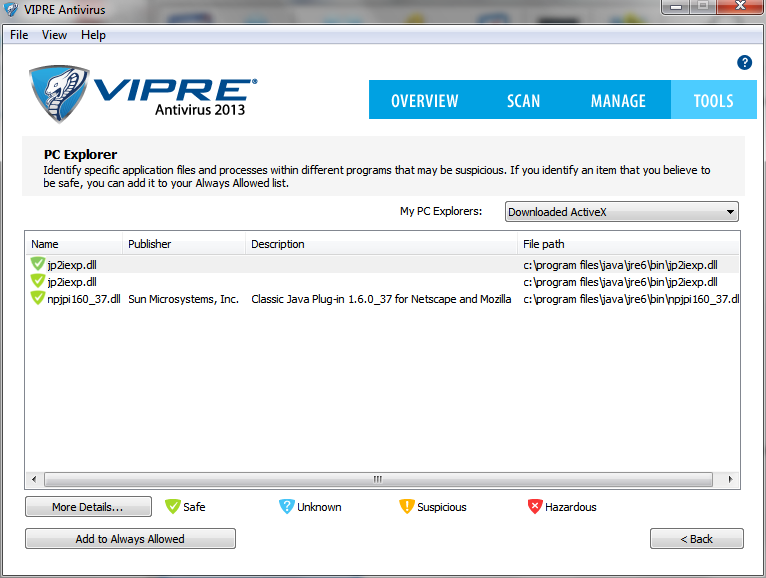 VIPER 2013 offers competitive pricing for its antivirus software. You can purchase 1 years protection for 1 PC at $39.99, or, 1 year protection for up to 10 PCs for $59.99. If that’s not to your liking, then you can get lifetime protection for 1 PC for $79.99. And you can try VIPRE 2013 for a full 30 days before you buy! Overall, I was impressed with the interface and easy configurability of the program. I also like the fact that I not only get antivirus protection, but also anti malware protection and email security. Another plus is that the scans don’t slow down the PC. This was a major issue I had with the previous security system and I’m happy that this is no longer an issue for me. Considering the fact that I picked up a few Trojans during the scan process, I can only say that I’m relieved I now have a more secure antivirus program installed. Overall, most of my basic requirements were met, but only time will tell how effectively my PC is protected and secured by VIPRE 2013. 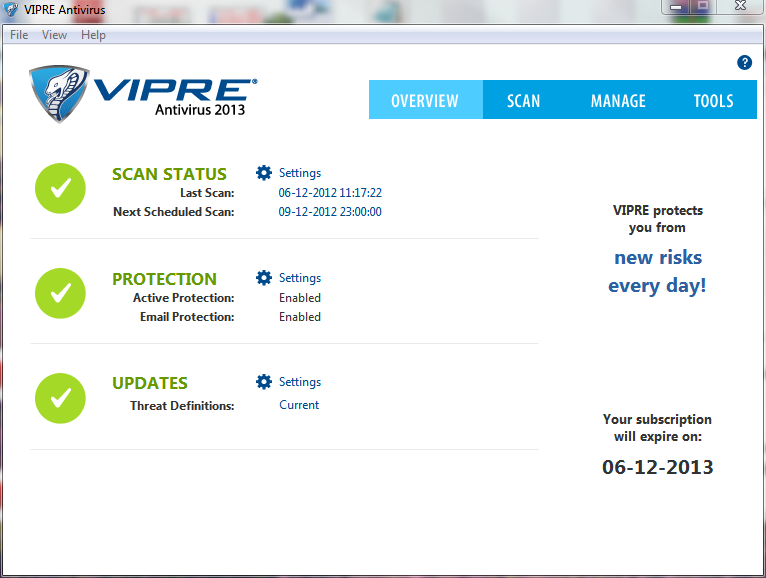 If you are like me, looking for a viable alternative to the many antivirus programs out there, give VIPRE 2013 a try! 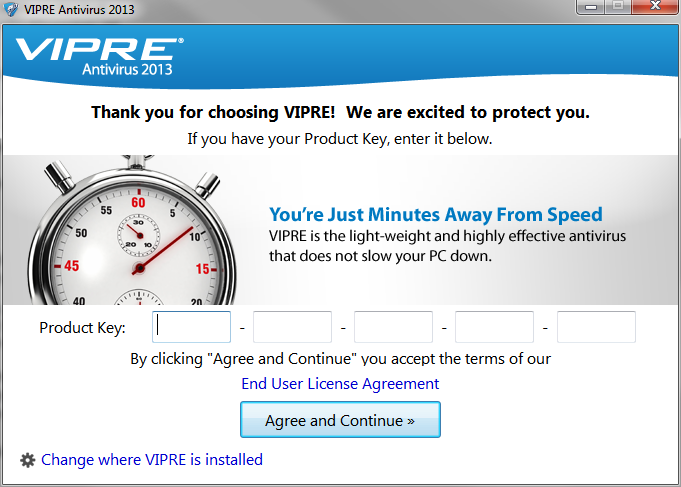 If you already have VIPRE 2013 installed on your PC, tell us how the software worked for you.